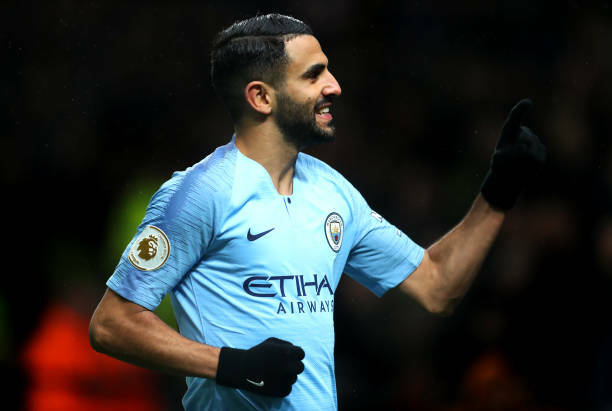 Riyad Mahrez has revealed that Manchester City will return stronger from their scare at Watford, but insists any of the top-four teams can still beat them to the Premier League title. Manchester City, who face Chelsea at Stamford Bridge on Saturday evening, extended their unbeaten run after Leroy Sane and Mahrez struck either side of half-time at Vicarage Road. But the champions were given a fright in the concluding stages when Abdoulaye Doucoure bundled over from close range with just five minutes remaining. Despite facing a nervous end as Watford went in search of what, for most of the match seemed an unlikely point, Pep Guardiola’s side held firm to claim their seventh consecutive league victory. The City squad will now be given Thursday off ahead of their match against Chelsea this coming weekend, despite their healthy advantage, Mahrez believes Chelsea, Arsenal and Tottenham, as well as their closest rivals, Liverpool, remain in title contention. “Anyone in the top four can still win the league. “Nothing is done and we need to keep working very hard for each other and try to win every game. “Now we need to focus every three days, and we need to be ready and at our top. “You are not going to win every game 4-0 or 5-0, and going through these types of games makes you stronger. City took a one-goal advantage into the interval following a dominant opening period. It could have been more, but for the heroics of Watford goalkeeper Ben Foster, who pulled off a string of fine saves.